There he goes, into that drugstore. He's stepping on the scales. Weight? 237 pounds. Fortune? Danger. Whoooooo is it? The Fat Maaaan! 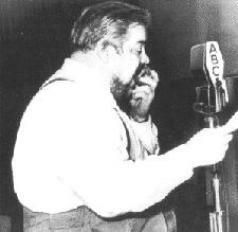 was not only a famous radio actor, also an accomplished stage actor, jazz historian and musician, amateur gourmet chef, newspaper writer, and artist. There was a steady climb in popularity that caught the attention of Norwich Pharmaceutical Company. They wanted a way to advertise their Pepto Bismol. 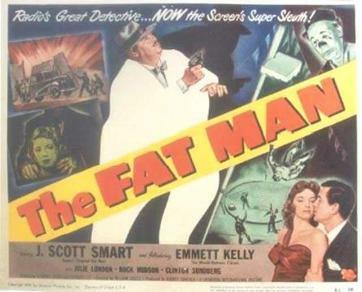 Norwich Pharmaceutical Company sponsorship of "The Fat Man" started around February 1947. The series lasted six seasons. communist hysteria of the day. Norwich Pharmaceutical Company was quick to withdraw its sponsorship. Kelly, wherein the investigation of a dentist's murder leads Runyon to a circus showdown. with the radio. It's a dizzy world--makes the movies seem highly intellectual." 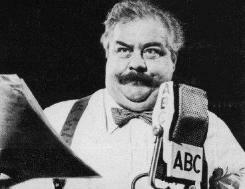 Australian Fat Man was played possibly by Lloyd Berrell. Although not featuring J. Scott Smart, who really fit the part, the series is quite good. 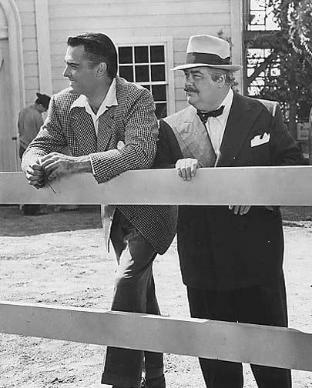 Smart and John Russell promotional photo.